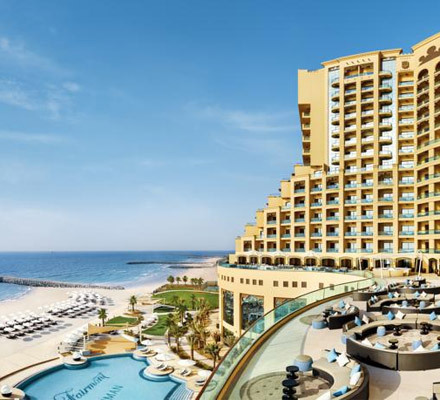 Where: Perfect for escaping the hustle and bustle of Dubai for a weekend getaway, Fairmont Ajman is perched upon it’s own idyllic cove beach on Ajman’s Corniche, and is just a short 35-minute drive from the city (with the exception of Thursday night’s usual backlog). Having just opened earlier this year, the 252-key resort offers a real fresh, revitalising feel. Stepping through the lobby, you’re surrounded by modern décor combined with contemporary touches, with light and dark hues. Inside our Junior Suite, we were stunned by breath-taking views of the Arabian Gulf – especially at sunset, it’s such a relaxing sight. From the Le Labo bath amenities and rain shower, to the plushly-dressed king bed, it’s safe to say you’ll more than unwind in this room. Facilities & amenities: With its own lifeguarded beach and irresistible infinity pool, Fairmont Ajman is a sun-worshipper’s dream – not forgetting the in-pool bar, which serves all sorts of frozen cocktails, mocktails and refreshing beverages throughout the day. Taking relaxation levels up a notch, the hotel is also soon to open its Spa, which will include designated ladies and men’s treatment rooms, eight in total, a Jacuzzi area, steam and sauna rooms, an invigorating ice shower and more. There’s also a 24-hour health and fitness centre. What we ate: Although the resort has a total of seven F&B outlets, the highlight had to be the dining experience encountered at the recently-opened Kiyi Restaurant, an authentic Turkish outlet, which takes you on a journey of flavours from start to finish. Celebrating the diversity and culture found in traditional Turkish food, the menu explores both classic and contemporary dishes. Served in an Imperial Ottoman setting, the atmosphere feels very genuine and almost makes you feel as if you were inside a wealthy Turkish family’s home during dinner-time. From succulent grills to delicacies such as Et Sotesi, pan fried beef fillet in rich tomato sauce, and Kuzu Tand?r, slow cooked lamb shank and a generous seafood selection, you wont leave hungry. We also enjoyed a delicious dinner at Gioia, the hotel’s modern Italian restaurant, where an open-kitchen and traditional pizza oven creates a welcoming air. Think of your usual Italian favourites with a twist. My personal favourite had to be the deconstructed take on Tiramisu! For breakfast, Spectrum, the all-day-dining outlet puts on a generous spread – catering to all nationalities and tastes. Best for: A relaxing, luxurious weekend away with your other half, or close friends. If you want to go: From Dhs954 per night. Call +971-6-7015757 | E-mail ajman@ fairmont.com.